In steelmaking processes, quicklime is generally used to produce CaO-based slags, and its dissolution rate is important for steel refining. The dissolution rate of quicklime is conventionally measured by the rotating cylinder method using dense and hard lime samples which gives rates that are slower than estimated rates from the actual operation. The authors established a new method to measure the dissolution rate of quicklime by measuring the variation of slag composition and reported that the quicklime used in the actual operation had a much higher dissolving rate than that of completely calcined quicklime. The significant increase of the dissolution rate was caused by gas formation from the quicklime due to the thermal decomposition of residual limestone existing in quicklime. 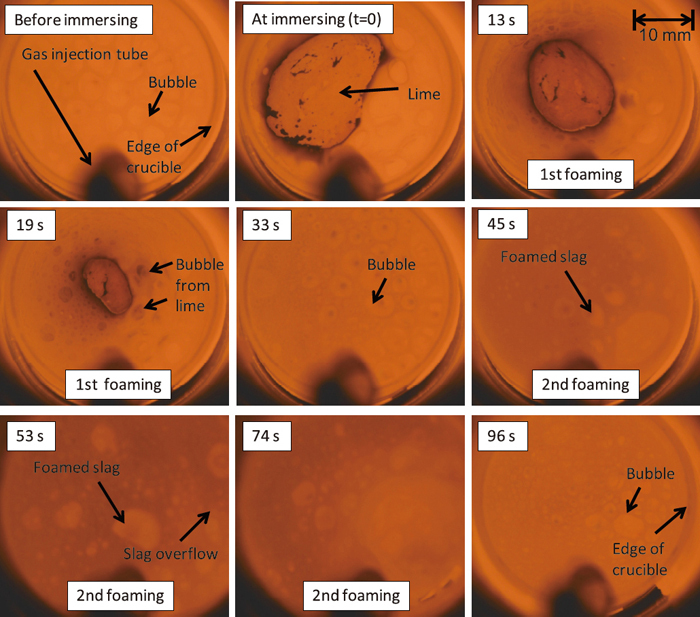 In this study, the dissolution rate of quicklime with the accompanying gas formation is quantitatively investigated by using quicklimes with different CO2 contents produced by a rotary kiln process through the direct observation of the dissolution behavior of quicklime particles and the change of the CaO content in the slag. The results revealed that quicklime emits the gas in two steps, and the second occurrence of gas formation effectively enhances the quicklime dissolution. The weight of the CaCO3 core differed among particles from the same grade of quicklime, and the corresponding dissolution rates were different as well. The dissolution rates of quicklime during the second foaming, however, were 5–10 times higher than without foaming and were similar regardless of the CO2 content in a quicklime particle.